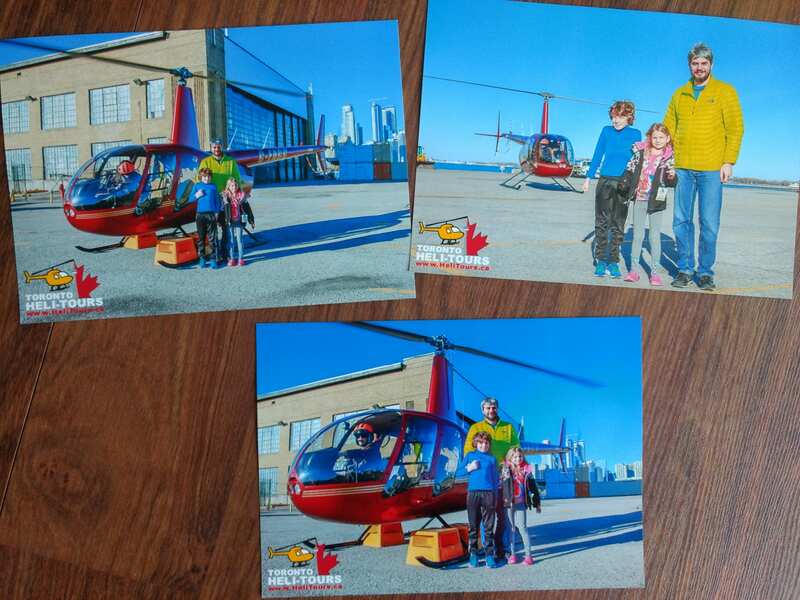 A family helicopter ride over Toronto is a fun way to add some excitement to the long days of work and school in between vacations. Not sure if it’s too expensive or too scary for little ones? From booking the flight to getting to the airport, this Toronto Heli Tours review has everything you need to know before you go. Booking is an easy process, whether you choose to book through the Heli Tours website or if you purchase through Groupon (which is what we did). There are more ticket options through the website, however, Groupon offers some excellent savings, so have a look at both and choose what works best for you. Our family – ever on a budget so we can travel more – enjoyed a weekend evening flight for $169. Taxes were extra and paid on site at check-in, which came to around $22. 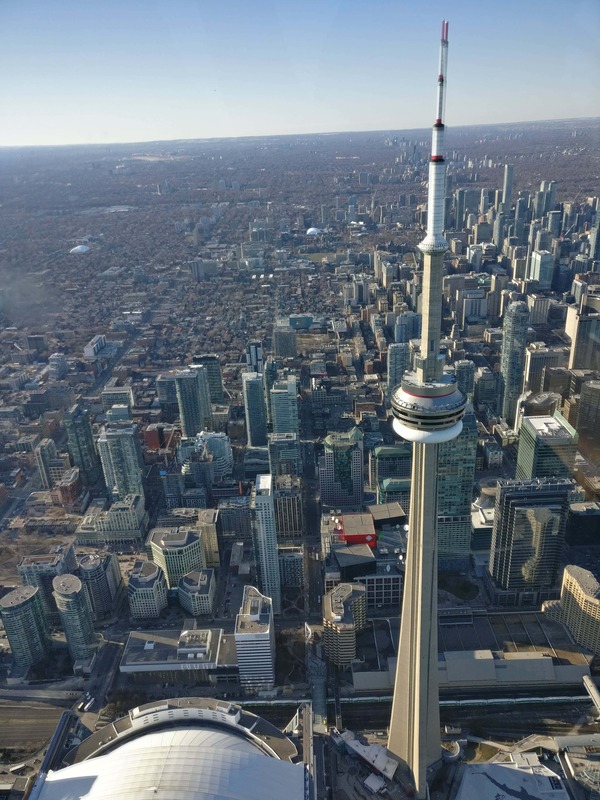 Our package included an 8 minute flight over Toronto with a CN Tower fly-by. We also received three 5”x7” photo prints, which was nice because those are sold separately on the Heli Tours website. There is room for three passengers and the pilot on board: two in the back and one in the front seat. Being 2,000 feet above sea level allows quite a unique view! Thank goodness every seat is a window seat. First thing you want to do on the day of flight is call in and confirm that everything is still a go. Weather conditions can affect helicopter tours, so staff will either confirm your flight or assist in rescheduling. If all is well, plan to arrive 30 minutes before flight time (directions below). Upon check-in your weight will be collected, ID confirmed, and you’ll watch an instructional safety video. Then you’ll be photographed in front of the helicopter and quickly loaded in for your exhilarating flight over the city! As flight time drew nearer, everyone was starting to feel a little nervous. It was the first helicopter ride for everyone, and no one quite knew what to expect. Happily, the Heli Tour staff was exceptionally welcoming – and amazing with kids – and quickly put everyone at ease answering questions and going over the safety video. Boarding the helicopter is very fast and next thing you know, you’re in the air! Everybody was so excited and exhilarated after the flight that all fears were totally forgotten. Did you know there are no upper age limits on who can fly? 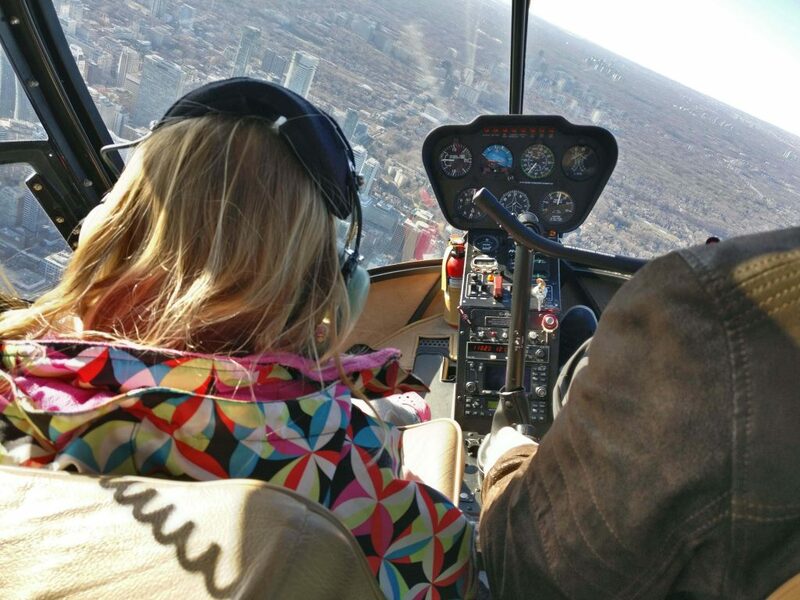 Seniors over 100-years-old have taken Toronto Heli Tours flights. If they can do it, so can you! I was a little unsure when I booked this tour with a Groupon. I thought I might have trouble booking a date or there would be some unexpected costs. In fact, I was really pleased with the whole experience! I had no trouble booking my date of choice. The staff was excellent: incredibly friendly and welcoming; they gave colouring pages to the kids while we waited, and they were quick to return phone calls when I called with questions. The helicopter pilot didn’t say a word for the whole flight – not even hello – which I thought was a little disappointing. The ground staff though, was superb. There are a couple restrictions on who can fly. Children must be 5 years or older (Heli Tours says 4 here, but in my written confirmation it said 5). The maximum weight allowance for an individual passenger is 260 lbs; all three passengers must not exceed 600 lbs total. Shoes, cameras, etc will be totalled into your body weight. There is no photography allowed at the actual launch site because it’s technically military ground. If you want a photo in front of the helicopter, you will have to pay for it. Heli Tours departs from Billy Bishop Airport, Toronto’s downtown airport. The easiest and fastest way of getting there is by the dedicated airport shuttle that runs from the Royal York hotel every 15 minutes. It’s free, and takes about 15 minutes to get there. The airport is on an island, so you have a choice of either taking the ferry or walking through the tunnel. Personally, I think the tunnel is faster. There are no signs at the airport for Heli Tours, so when you come up the escalator from the tunnel, turn right, go out the doors, and you’ll see the Heli Tours building across the parking lot. It looks like a mobile trailer and the building itself has Heli Tours signage. Overall, we had a great experience and made amazing memories. What do you think? Is a Heli Tours flight in your future?